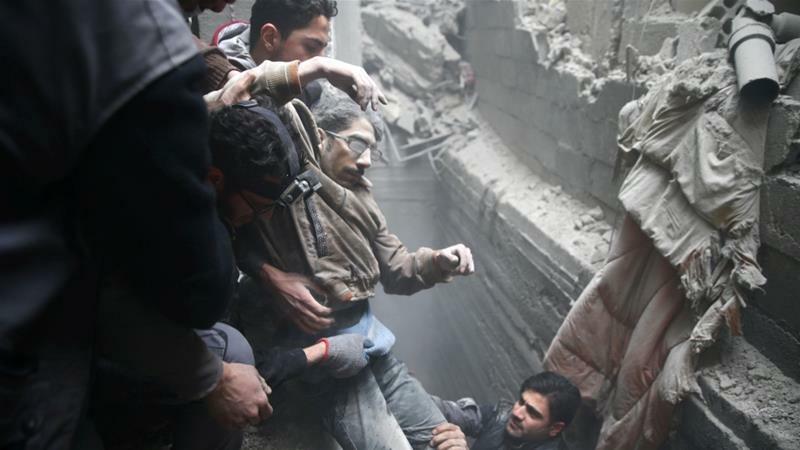 The death toll in East Ghouta, near Syria’s capital Damascus, has passed 400 since pro-Assad attacks escalated on Sunday. Preparing for an invasion, the Assad regime and its foreign allies have been bombing, shelling, and rocketing the area of more than 350,000 people. Months of bombardment and more than five years of siege have been stepped up, with 22 medical facilities reportedly targeted and several put out of service. Local sources estimate more than 2,100 people have been wounded in five days. Seeing a father or mother wailing and crying over their dead children, or a father carrying his son who has one leg amputated, or another screaming at God and then at people to help save his family who are all lying under the rubble of a building … I try to comfort them even though I want to sit and cry with them from the horror of what is happening all around us. Every day goes like this: bombings, then I clean the house from the effect of the nearby shelling, then we hide in one room, attempting to survive or die together. My daughter Sara and I wake up with our arms around each other from the night before. We all sleep on one mattress. She hugs me and asks me why she can’t go out to play, or to school or to see her friends. I cannot answer her. Survival of the mass killing has been hindered by difficulties in obtaining food and medicine, with scores of people dying even before the surge in the pro-Assad assault over the winter. Russia, enabling the attacks, has blocked a UN Security Council resolution for a ceasefire. The text, put forward by Sweden and Kuwait, called for a 30-day cessation of hostilities to allow the delivery of aid and evacuation of civilians. But Russian UN ambassador Vassily Nebenzia said Moscow presented amendments for the ceasefire “to be realistic”. As White Helmets rescuers tried to save people and retrieve bodies in East Ghouta, Nebenzia accused them of being “closely affiliated with terrorist groups”. The Assad regime’s ambassador, Bashar al-Ja’afari, accused the UN and mainstream media of backing “terrorists recruited by the US from all over the world”. We are talking about a systematic targeting of civilians in their homes, schools, medical centres, marketplaces, and civil defence sites. This is an extermination of the society in this area. There are families who have been hiding in basements and underground shelters who haven’t seen the sun in days for fear of the brutality of the regime and the Russian warplanes. “We don’t know whether we will be alive to tell the world what is happening in the next hour or day. The rocket launchers are relentless, and the warplanes have not left the skies…. Everyone here knows this is a slaughter and a crime against humanity. This is a war against civilians. The Turkish military says it has struck a convoy of fighters entering the Kurdish canton of Afrin in northwest Syria, but the Kurdish militia YPG said the vehicles had civilians entering with food and medicine. Kurdish officials said the convoy, which arrived in Afrin late Thursday, had brought hundreds of civilians from the Jazeera canton in northeast Syria. It said one passenger aws killed and at least ten wounded as cars were set on fire. Human Rights Watch said on Friday that it investigated three attacks in Afrin last month, soon after the start of the Turkish-rebel offensive on Afrin, in which operations failed to prevent civilian casualties. Airtrikes and shelling on a cluster of tents, a poultry farm, and a house killed 26 civilians, including 17 children, HRW summarized. You are remorseless and immoral. You don’t feel the tiniest discomfort of the massacre of hundreds of children, women and civilians every day in East Ghouta but you express your annoyance at our fight against terrorists. You are spreading fake news. On Wednesday, Pentagon spokesperson Adrian Galloway said US authorities will “do their best in their contacts with their Turkish counterparts to reduce tensions and harm to civilians”. Yevgeniy Prigozhin, a close ally of Russian President Vladimir Putin, was in close touch with the Kremlin before a failed assault by Russian fighters on a US-backed, Kurdish-led force in eastern Syria on February 8, according to American officials. Prigozhin reportedly oversees the Wagner Group, the Russian “private military company” which has carried out some of Moscow’s ground operations in support of the Assad regime since 2013. Reports from colleagues, doctors, and relatives indicate up to 200 Wagner fighters were killed, among 300 casualties, when about 550 personnel attacked the Syrian Democratic Forces in Deir ez-Zor Province. The attempt to take area around a gas plant was foiled by US airstrikes, the first deliberate assault on pro-Assad ground units in Syria’s 83-month conflict. The US officials cited ntercepted communications in late January between Prigozhin and a senior Assad regime official that the Putin ally had “secured permission” from a Russian minister to move forward with a “fast and strong” initiative in early February. See also How to Defend Russia’s “Private Military Companies” in Syria? Write a Song. Prigozhin was one of 13 Russians indicted last week by Special Counsel Robert Mueller over Moscow’s interference in the 2016 US Presidential election. First as a restaurateur in St. Petersburg and then as teh head of an expanding business empire, Prigozhin has been a friend and associate of Putin. The relationship has assisted Prigozhin’s large contracts with the Russian Defense Ministry. PreviousBBC Radio: A Turning Point in US for Gun Control?